Nothing tastes better on a hot summer day at the beach than ice cream, so I decided I wanted to participate in Suzy's Ice Cream Social. Visit her blog Kitchen Bouquet to see who else is participating, I just know there's going to be some amazing recipes! I decided instead to post some vintage pictures, because you know I love vintage pictures. These are all from the Library of Congress and I hope you enjoy them while your munching on your ice cream. This lithograph advertising our favorite summer treat was created and published by Currier & Ives in 1879. 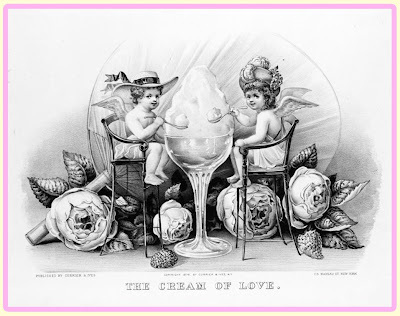 Two winged cherubs, wearing fancy hats, and eating a very large dish of ice cream, with very large flowers on floor. I hope you all enjoy visiting the other posts and if you need help eating all that ice cream, let me know! She shares the most awesome vintage cards, photos, ads, etc. 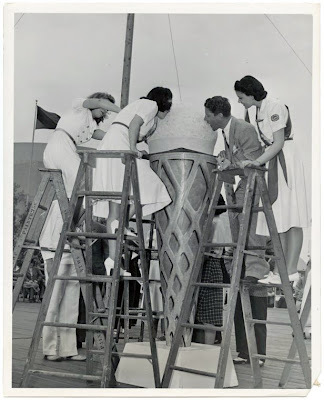 Great vintage photos...I chuckled at Rudy Vallee at the World's Fair. That is one LARGE ice cream cone! I have been fighting off going for an ice cream run this afternoon! However, I may give into tempation this evening. Love the vintage pix. Your pictures are just fantastic. Thanks so much for sharing them with us. Have a wonderful weekend. 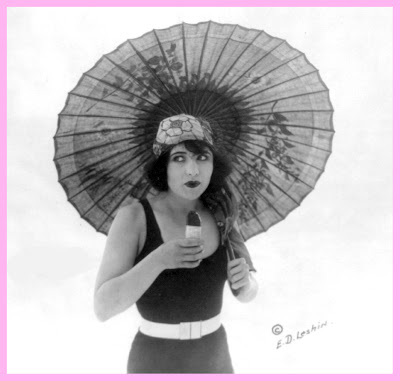 Great vintage pics...Ice cream spans the generations! Yes, bless your heart for being so helpful with the ice cream :). That is so funny. I'm with you, I'll help anyone who needs help with disposing of the ice cream! Ice cream eating contest!!!!!!!!!!! I can feel the brain freeze already! I love those vintage photos Rhonda! I love the ice cream eating contest photo!!! Fun post! Love the vintage pictures! That last photo is especially awesome~ thanks for sharing! Every June (Dairy Month) they offer ice cream on the steps of the state capital building. My husband is a state worker and always makes a point of going over to get some ice cream. It's no contest, but it is a lot of ice cream. p.s. Thanks SOOOOOO much for emailing that photo. YAY!